Preparing for Your First Surf Lesson? 05 Feb Preparing for Your First Surf Lesson? Preparing for Surf Camp? Here’s how to get ahead of everyone else! It is very important to go into your first lesson ready to learn and thinking positively. If you have a negative mindset or too many doubts in your head about not being able to learn, you have already dug yourself into a hole. Going in with an open mind and being ready to give it all you’ve got will allow you to get the most out of the lesson and you’ll be popping up on that board in no time. One of the most beautiful things about surfing is that it forces you to live in the moment, allowing all expectations and worries to fade away. You can’t expect to immediately be a pro or never fall into the water; making mistakes is a key part of the learning process! Allow yourself to wipe away all your frustrations, disappointments and complaints from your mind and focus on enjoying the moment. After all, the best surfer is the one having the most fun. As your stress fades away and you begin to feel more comfortable, you’ll soon be riding the waves with an enormous and permanent smile on your face! While surfing is an absolute blast, it is also a very physically demanding sport. To be in “surfing shape”, this requires a wide range of physical qualities in order to paddle-out, catch a wave, balance on a surfboard and make some big turns and aerial moves. Surfing is composed of short rushes of cardio and adrenaline, so being able to run a marathon is not necessarily going to help you in this case. Rather, you want to be able to do intense workouts in short spurts of time, cool down for about 30-60 seconds, and then do it all over again. 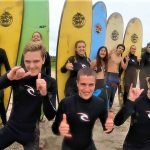 Quality surf training will help you avoid injuries while performing better in the water, catching more waves and enjoying a fun surf session. 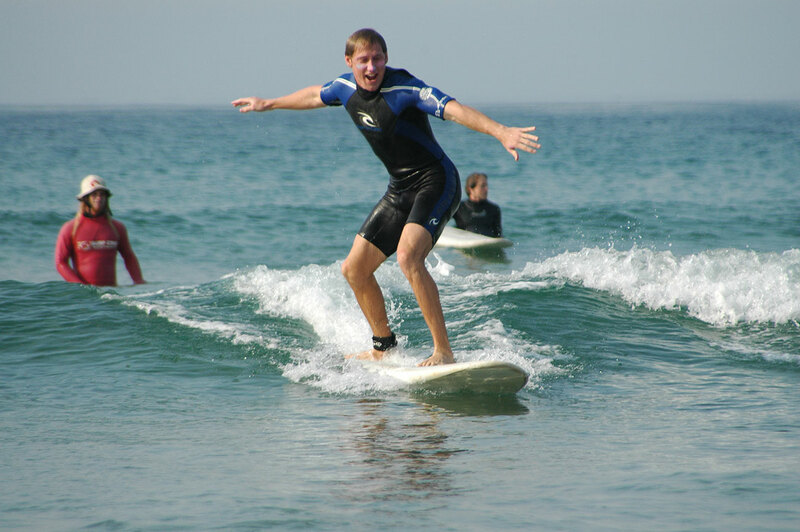 Standing up on your board is one of the first steps to surfing and it is something that is easy to practice on your own without an instructor, waves, or even a board! Check out our videos of the Stand Up Technique so you can practice on your bed, couch or any other space you can find in your house. Not only does practicing this prepare you more for your lesson, but you can also turn it into an interval workout, yeeeeewww! Mastering, or beginning to master the pop-up technique will give you a leg up on others trying to learn how to surf as well. A rip current, commonly referred to as simply a rip or “rip tide“, is a powerful, fast-moving channel of water that moves directly away from the shore and cuts through the lines of breaking waves. Rip currents are capable of carrying even the strongest swimmer away from the shore. Some of the more recognizable characteristics of a rip current include a line of seaweed or debris that is flowing steadily out to sea, a choppy channel of water, or a disrupted pattern of incoming waves. It is important that you know how to recognize a rip current and that you know how to escape one if needed. If you get caught in the current, your first instinct will be to swim against the current and back to the shallow water. This is not going to work for you. The ocean is much stronger than an individual, no matter how well of a swimmer you may be. Instead of swimming against the current, you have two options: swim parallel to the shore or follow the current out. First try to swim sideways, or parallel to the beach, and then you should be able escape and ride the waves back to shore. If you cannot swim parallel, your next option is to ride the current out and follow it to more calm waters. No matter what option you take, it is very important to remain calm. You do not want to waste energy by thrashing around and panicking. So before you go out and have the time of your life, get to know rip current safety!